The highest summit alone in the world – the Everest climbing – is an exciting and a terrific experience. The climb will be led along the normal route via the south Col, installing a base camp at 5334m and four additional camps in the mountain region at approximately 5800, 6200m, 7200m and 8000m respectively. The Everest along this route is technically straightforward but climbers must be aware of the potential sudden weather changes and the risks involved. Mt. 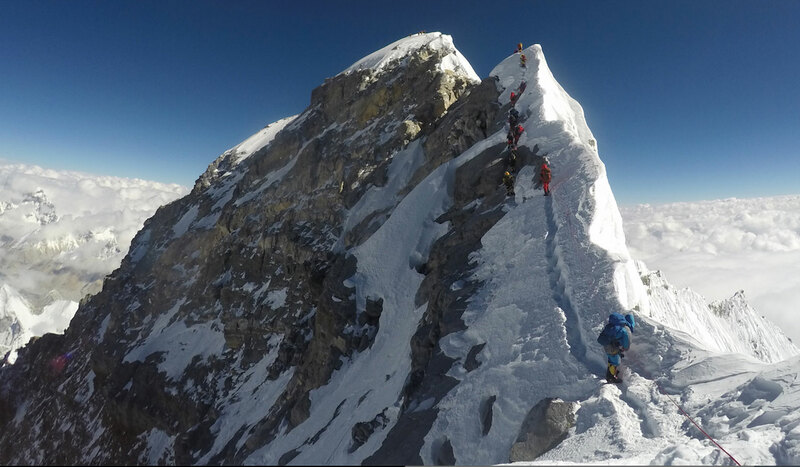 Everest has two main climbing routes, the southeast ridge from Nepal and the northeast ridge from China, as well as many others less frequently climbed routes. Of the two main routes, the southeast ridge is technically easier and is the more frequently-used route. It was the route used by Hillary and Tenzing in 1953 and the first recognized of fifteen routes to the top by 1996. Day 01 Meeting upon arrival at Kathmandu international airport, Transfer to Hotel. Day 02-04 Stay in Kathmandu for official procedure, Overnight at Hotel. Day 05 Fly to Lukla, trek to Phakding (2640m), Overnight at Lodge. Day 06 Trek to Namche Bazaar (3446m), Overnight at Lodge. Day 07-08 Stay at Namche Bazaar (3446m) for acclimatization, Overnight at Lodge. Day 09 Trek to Tyangboche (3867m), Overnight at Lodge. Day 10 Trek to Pheriche (4243m), Overnight at Lodge. Day 11 Trek to Lobuche (4930m), Overnight at Lodge. Day 12 Trek to Everest Base camp (5400m), Overnight at Tented camp. Day 64 Trek to Tyangboche (3867m), Overnight at Lodge. Day 65 Trek to Khumjung, Overnight at Lodge. Day 66 Trek to Phakding (2640m), Overnight at Lodge. Day 67 Trek to Lukla (2800m), Overnight at Lodge. Day 68 Back to Kathmandu, Overnight at Hotel. Day 69 Rest in Kathmandu, Overnight at Hotel. Day 70 Transfer to airport, departure your own destination.